A fountain with singing bowls? Yes, you will like this one! 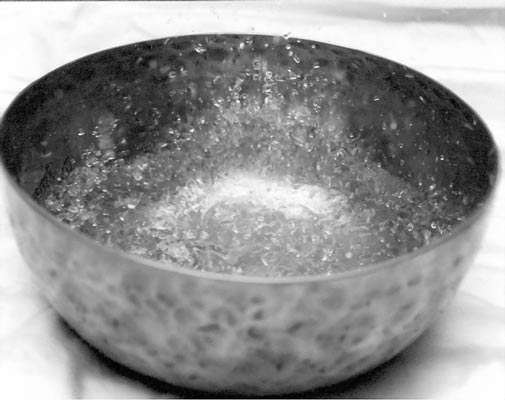 Put water in your singing bowl, fill it a third or half way, and hit it with a padded striker, preferably a soft striker. As you strike softly you will notice nice patterns of ripples on the water. 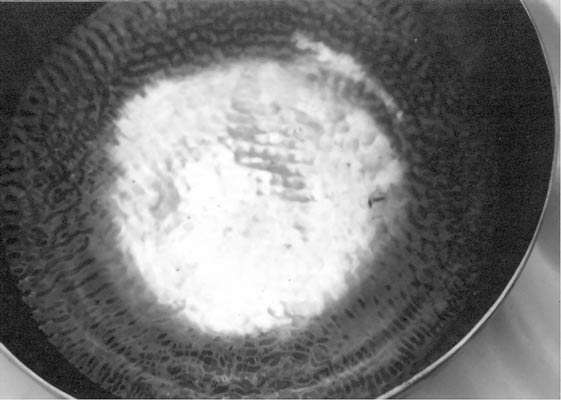 They are the sound waves traveling over the surface of the water from the wall of the bowl towards the middle, creating interference patterns. Quite nice to see. You will also notice that you can now see the four nodal points from which the sound emanates: the place where the striker hits (a) , the place opposite to it (b) and the two points half way between a and b on the wall of the bowl. As you continue with rhythmic striking, gradually increase the strength of the blow. The force of the sound waves will push the water upwards and a multitude of water drops jump up and down the bowl, a fountain of sound propelled water drops! Some bowls work better than others. Do not strike your bowl too hard trying to make it happen.